The average American today is bombarded with as many as 5,000 advertisements a day. The sophisticated and persuasive marketing tactics that companies use may seem a recent phenomenon, but Pioneers of Promotion tells a different story. In this lively narrative, business history writer Joe Dobrow traces the origins of modern American marketing to the late nineteenth century when three charismatic individuals launched an industry that defines our national culture. Transporting readers back to a dramatic time in the late 1800s, Dobrow spotlights a trio of men who reshaped our image of the West and earned national fame: John M. Burke of Buffalo Bill's Wild West, Tody Hamilton of the Barnum & Bailey Circus, and Moses P. Handy of the World's Columbian Exposition in Chicago. Drawing on scores of original source materials, Dobrow brings to light the surprisingly sophisticated techniques of these Gilded Age press agents. Using mostly newspapers--plus a good deal of moxie, emotional suasion, iconic imagery, and to be sure, alcohol--Burke, Hamilton, and Handy each devised ways to promote celebrities, attract huge crowds, and generate massive news coverage. As a result, a plainsman named William F. Cody became more famous than the president of the United States, a traveling circus turned into the Greatest Show on Earth, and a world's fair attracted more than 27 million visitors. 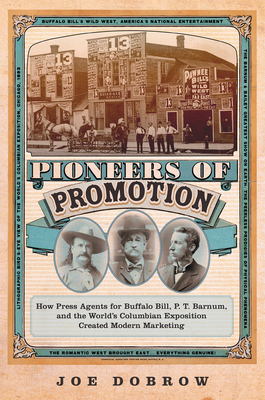 Tapping his practitioner's knowledge of marketing and promotion, Dobrow reintroduces readers to Buffalo Bill and his Wild West show, P. T. Barnum and his circus, and the greatest of all world's fairs. Surprisingly, the promotional geniuses who engineered these enterprises do not appear in history books alongside other marketing and advertising legends such as Ivy Lee, Edward Bernays, or David Ogilvy. Pioneers of Promotion at long last gives these founders of American marketing their due.